How Long (Blues Boulevard) is the third Alvin Jett album that I�ve come across, and the second with the Phat Noize Blues Band � in 2005 Alvin brought out Wet My Beak, and in 2006 came Milk & Cookies with the band. Unfortunately, if you have the other two CDs, you have all but one of the 15 tracks featured on this album � having said that, if you don�t have the first two CDs, then this is a good way to get a feel for Alvin Jett and his music. All of the tracks are originals, mostly written by either Alvin Jett, or sax player Frank Bauer, or a combination of the two (apart from �Best Friend You Ever Had,� written by bass player Matt Davis). Alvin Jett is a native of East St.Louis, and didn�t start playing guitar until the age of 20, despite coming from a musical family. However, it�s pretty obvious that he grew up listening to a vast amount of music, because the influences in his music are many and varied. The tracks on this album encompass just about every tempo there is, from slow ballad, to hard driving rocking blues, and there�s something for just about everyone who likes modern blues. This is a tight band, with great guitar work from Jett and marvelous sax playing by Frank Bauer � the quality of the musicianship shines through. The album opens with the very appropriately named �Boogie To The Blues,� a real foot-tapper and a good opening track � it moves into �Aint Been The Same,� another up-tempo number, before slowing down with �How Long,� a track with an insistent bass line that is my favourite on the CD. From then on the tempo varies from slow ballad, through medium, to up-tempo. There�s no chance to get bored with a mix of music like this! Here�s a guy who started producing albums back in 1995, and as far as I can tell this is his 6th. 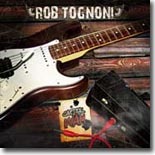 Rob Tognoni was discovered by Australian bluesman Dave Hole, and he is certainly a fantastic guitar player � no doubt about it. Capital Wah (Blues Boulevard) is very firmly in the Blues-Rock genre � hard driving music most of the way through. Two of the tracks were recorded live in Prague, in the Czech Republic in 2006 � �Product Of A Southern Land� and �Red House,� and they give a good idea of how good this musician is at playing in front of a live audience. The version of �Red House� on this album is up among the best I�ve heard. The album is a little too much rock and not enough blues for my taste, but that�s not to say that it isn�t a good CD. For those who enjoy hard blues-rock this is a CD well worth adding to a collection. 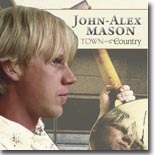 It�s still January as I write this, and already I have a strong contender for my favourite blues CD of 2008!Town & Country is the first that I�ve heard of John-Alex Mason, a Colorado native who recorded his album in Boulder, but I�m hoping that I�ll be hearing a lot more of him. Seven of the 15 tracks on the CD are originals, the remainder being copies of mainly traditional old blues � it�s not easy to choose between them for a favourite, as the originals are all well-written and performed. However, I have (just) managed to pick out a favourite, and it�s only really because I�ve liked every version of it that I�ve ever heard, making it just about my favourite blues song of all time � �Shake �Em On Down.� And, I should be so lucky, there are TWO versions of it on this CD!! Some of the original songs are as good as any traditional old blues, and they show that this musician has a real feel for the blues, especially traditional country blues. The CD opens and closes with versions of �Shake �Em On Down,� which I�ve already made mention of, and then goes into two Mason originals, �Steel Pony Blues� and �Bury My Boots.� The latter could easily be taken from a 1930s bluesman�s songbook, it has so much atmosphere. There are covers of �Terraplane Blues� (Robert Johnson), �Cypress Grove� (Skip James), �Shake Your Moneymaker� (Elmore James), and the traditional �Jitterbug Swing,� �Boll Weevil� and �Milk Cow Blues,� and a great mix of songs written by John Alex Mason. The feel the whole way through the CD is of quality, mainly country-style blues played in an authentic style that would do credit to many of the big bluesmen of the 40s and '50s. To see a photo of John Alex Mason, and then relate the face to the voice, is very difficult � he looks like a surfer, but sounds as though he�s at least 60 years old! But, make no mistake, this guy can write and sing the blues with the best of them � and he deserves a wide audience.Buy this CD and enjoy! Catherine Russell's Sentimental Streak (World Village Music) is just that -- a sentimental look back at an era when blues and jazz styles came together in classy mid-town venues. In some ways, it's a tribute to her father, Luis Russell, a noted jazz pianist who performed with jazz pioneers King Oliver and Louis Armstrong in the first half of the 20th century. This homage begins the album with "So Little Time (So Much To Do)," based on Armstrong's 1938 recording when Mr. Russell was Satchmo's musical director. Ms. Russell has just the right voice for this material --- one can easily imagine her fronting the band is some WWII-era black and white movie. Ms. Russell also acquits herself well when covering songs from some of the greatest female singers of the era, such as Pearl Bailey's "I'm Lazy, That's All," Ella Fitzgerald's "Oh Yes, Take Another Guess," Alberta Hunter's "My Daddy Got A Brand New Way To Love" and "You For Me, Me For You" and Lena Horne's enticing "Thrill Me." She can also do more of a down and dirty style, as seen on Bessie Smith's ribald "Kitchen Man," on which she extols the virtues of her man's hot jellyroll, his succotash and turnip tops, and his bologna. Of course, she's not talking about food here. This song has the sparser accompaniment of only two guitars (Larry Campbell, Matt Ministeri) and the tuba of Howard Johnson. In fact, the musicians behind Ms. Russell are all very good. They do just what they are supposed do --- "accompany," not overwhelm. Where the song, such as the two Alberta Hunter tunes, requires minimal accompaniment, they feature only solo musicians, Mark Shane's piano in one case and Munisteri's guitar on the other. Providing a very different sound on two cuts is the inclusion of Rachelle Garniez's accordion on the slow jazzy Sinatra number, "South To A Warmer Place," and Garniez's own composition, "Broken Nose." The accordion is mixed to be more in the background than the other instruments, giving these recordings more a "live in a European courtyard caf�" feel to them. The only criticism of this album is that the recordings sound just a little too clean and sterile, with not nearly enough background warmth. I would love to hear these same songs done in front of a live audience to capture that missing buzz. For example, Willie Dixon's "I Don't Care Who Knows" (based on Harold Burrage's version) cries out for a dirtier, back alley sound. But overall, Sentimental Streak is a delightful album that will please fans of both classic jazz and sophisticated blues. 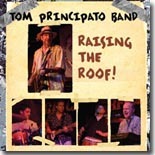 Veteran D.C. guitarist Tom Principato reinforces his reputation as one of the better guitarists around with Raising The Roof! on his own Powerhouse label. Like Principato's previous releases, this one is a nice mix of blues, jazz, funk and soul guitar, and backed by a tight band. The highlight for me is his cover of Louis Jordan's "Fish Fry," which sounds so much different from the original that it would barely be recognizable if not for he words. Principato takes Jordan's novelty jump blues and turns it into a slower, funkier interpretation. Very nice! Another fun one is the closing number, recorded live, which reflects every working musician's persistent frustration with getting the same songs requested from drunken audience members show after show, night after night. Played to the tune of the T-Bone Walker classic, the title, "They Called For 'Stormy Monday' (But 'Mustang Sally' Is Just as Bad! )," introduces the song. It continues with the following refrain: "'Proud Mary' is even worse and 'Brown Eyed Girl' is also bad .... 'Free Bird' flies on Friday and Saturday they yelled for Stevie Ray, I heard 'Little Wing!' cries on Friday and "Hey what kinda music y'all play? ... On Sunday they yelled for Jimmy Buffett, but oh that's one we sure as hell won't play!" But I digress. The opening number, "Lock and Key," is an uptempo number with a New Orleans beat, while the instrumental, "Too Damn Funky," is reminiscent of the kind of guitar workouts that the late Danny Gatton used to stretch out on. Tommy Lepson provides sterling Hammond organ accompaniment throughout, especially on the Jimmy Smith instrumental, "8 Counts For Rita." Principato does some of his best guitar work on the J.J. Cale original, "Lies," which gets downright funky at times. Raising The Roof! is a great addition to the vast Principato catalog. Check out the full selection at www.powerhouserecords.com. By now, everyone knows the scoop on Amy Winehouse --- her often bizarre but always intriguing behavior, the personal problems that landed her in rehab, the numerous Grammys awarded to her this past Sunday, etc. Like many other middle-aged blues fans, I live in isolation from most of pop culture. Thus, I was largely oblivious to Winehouse's music until an eager publicist sent me the American release of what was soon to be award-winning CD, Back To Black (Universal Republic), apparently figuring that it might be appropriate for a blues CD review site. Yeah, I know, the disc has been out for a while, but I'm in. The Grammy voters did something cool this year. I like this young woman's eclectic mixture of soul, jazz, R&B, ska and '60s girl group sound. After receiving this disc three weeks ago, I popped it into the CD player on my way to work. First up was the Grammy winner for best song, "Rehab," which with a vintage R&B groove and the hep cat background vocalists sounds like it could have been done by Ruth Brown. I was hooked. Another favorite is the energetic anthem "Tears Dry On Their Own," which sounds so much like Phil Spector's wall of sound that you will go looking at the liner notes to make sure that he didn't have anything to do with this production. But everything here was written or co-written by Ms. Winehouse. It's really an autobiographical reading of her chaotic life. The other real hero is producer Mark Ronson, who got to share in the Grammy glory with his own award. The sound that he captures on every cut is retro but never sounds dated. Few producers can capture this kind of vibe like Ronson did on everything cut. Expand your horizons. Be cool. Give Back To Black a listen. Eddy Clearwater's Recorded Live at the Rawa Blues Festival (Cleartone Records) isn�t a homemade or amateur DVD; it was produced by professional cinematographers. The performance was filmed by Polish National Television and was originally broadcast on their network. The Poles used multiple cameras including one on a boom. Since an option did not appear to select a 5.1 mix, it has been assumed the audio is only available in stereo. The concert was filmed at the Rawa Blues Festival, billed as the biggest indoor blues festival in the world, in Katowice, Poland on October 9, 2004. From the footage, it appears the festival is held at an excellent venue. A large crowd, who are all standing, is shown witnessing Eddy Clearwater�s antics. "How," a North American Indian stomp dance song is used to introduce Eddy �The Chief� Clearwater. He takes the stage in his trademark full Indian headdress and replaces it with a cowboy hat halfway through the song. In typical fashion, the lanky Clearwater is flamboyantly dressed in bright pants, a white shirt, and boots. Chuck Berry�s "Sweet Little Rock n Roller" is a classic rock �n� roll song from rock�s golden era, but this rendition lacks Clearwater�s usual animation. "2x9" has oomph and drive. Ironically, it sounds like it could have been written by Berry and comes complete with Berry riffs and duck walks. Long considered by some to be a Chuck Berry imitator, Clearwater incorporated rock �n� roll into his blues after hearing Berry in 1955. Clearwater�s vocals are tame and a little high-pitched, but he makes them growl now and then. At times, as on "Lonesome Feeling" and "Easy Is My Style," Clearwater, who was born Edward Harrington in Macon, Mississippi on January 10, 1935, sounds like one of Chicago�s West Side guitar masters. That�s no surprise, given the fact the tall southpaw guitarist, who originally performed under the name of Guitar Eddy, moved to the West Side at age 15. Clearwater�s guitar skills are exceeded by Mark Wydra, who breaks out the slide on "That�s All Right" and plays the most famous solo in blues. You know the one that Muddy Waters and Bob Margolin play so well? Throughout, Clearwater, named as a word play on Muddy Waters, regularly smiles and genuinely comes across as having a great time. For the most part, his supporting band is potent. The attractive bass-playing Heather Tackett practically disappears as she stands to the back and right of the stage. Drummer Merle Perkins is a solid but weary pounder. Irek Dudek, the Rawa Blues Festival director, makes a guest appearance on harp. Clearwater has always been more about feeling than virtuosity. His engaging personality will entertain you on this 90-minute DVD. It�s available at Clearwater�s gigs and his website (www.eddyclearwater.com). 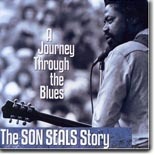 As he says on the Live and Burning album, Son Seals used to wake up and say, �Blues.� He had a uniquely aggressive Chicago sound as exemplified during the opening moments of this DVD, A Journey Through The Blues � The Son Seals Story (Vizztone/Sagebrush Productions). From there, the all too brief 30-minute documentary travels fast via a structured format. Born Frank "Son" Seals in Osceola, Arkansas in 1942, Seals is interviewed and reveals the bare essentials of his life and career. He discusses growing up in Arkansas and the influence of his father�s juke joint, The Dipsy Doodle. Regarding why he chose a life of music, Seals says, �I wanted to do what I saw other people do.� In 1971, Seals moved to Chicago. Soon after arriving, he landed regular gigs on the South Side at The Expressway Lounge and the Flamingo Club. Other key figures such as Bruce Iglauer of Alligator Records, Seals� sister, Seals� son, Koko Taylor, and Frank Pellegrino of Kingston Mines are interviewed. Producer Peter Carlson, who also made Don't Start Me Talking (The Junior Wells Story), has resisted using an all-interview format to tell Seals� story. The film also features live performance clips, vintage photos, and music from several of Seals� albums. The two had a business relationship, but most of all Seals and Iglauer were friends for over 30 years. While smiling yet visibly distracted (with emotion for the deceased musician), Iglauer catches himself, �Talking about him [Seals] in the present tense. His performances are so alive to me.� Iglauer also reflects on the grueling life of a traveling bluesman. �Nobody gets rich playing the blues. If you�re lucky you end up with a middle class lifestyle. If you are unlucky, you end up a broke old man.� Whether or not Seals was lucky isn�t given clarified, but the documentary does confirm Seals lead a life of hardship. Cash McCall (aka Morris Dollison, Jr.) got his start in the blues as a session guitarist for Willie Dixon at Chess Records in the early �60s and as a songwriter for Muddy Waters, Howlin� Wolf, and Little Milton. Dollison acquired his professional name after Thomas Records released a demo without his knowledge using the McCall moniker that he recorded in 1966 titled �When You Wake Up,� which became a surprise national hit. �That�s How It Is,� one of Otis Clay�s biggest hits, also came from McCall�s pen. In recent years, he played with Dixon�s Chicago All-Stars, the Chicago Rhythm & Blues Kings, singer Big Twist and the Chicago Blues Review, in addition to pursuing his own solo career. Dixon�s grandson, Alex, learned to play piano from Chicago legends Leonard �Baby Doo� Caston and Lafayette Leake. He also performed with his grandfather and even co-wrote songs on Dixon�s last CD, Hidden Charms (which McCall co-produced). The younger Dixon recently formed Dixon Landing Music, and teamed with McCall to form The Blues Experience. 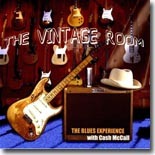 Their debut release, The Vintage Room, is an exhilarating shot of Chicago Blues.Appropriately, the band covers three classic Willie Dixon tunes, �I Just Want To Make Love To You,� �I�m Ready,� and �Bring It On Home,� all of which will be familiar to blues fans. Alex Dixon wrote seven of the remaining eight originals. Standouts include �Gypsy Woman,� featuring superb harmonica from Steve Bell, son of the late Carey Bell, and the clever �Slice Of That Pie.� Dixon�s songs successfully capture the same spirit and energy of his grandfather�s compositions. McCall contributes �Mama,� a reflective soul number, and his gritty, soulful vocals are right on the mark throughout the disc, as is his guitar work. In addition to Bell, also contributing excellent musical support are Bill �Young Blood� Learned and Katy J on rhythm guitars, Brady Wills on bass, and Vinnie Threats on drums, with Dylan Cooper guesting on upright bass for a couple of tracks. The Willie Dixon legacy is alive and well, thanks to Dixon's grandson Alex Dixon, Cash McCall, and The Blues Experience. The Vintage Room is loaded with songs and performances that remind you of those legendary Chess sessions of the '50s and late '60s. They don't make them like this any more. Barbara Blue has played a regular gig at Silky O�Sullivan�s on Beale Street for the past decade, and has become a Memphis must-see during that time. She�s released four excellent albums, the last three with the Phantom Blues Band in support, and even picked up a 2007 Blues Music Awards nomination as Contemporary Female Blues Artist of the Year. In addition, the UK�s Shout Records recently released an import compilation culling highlights from her four albums. A powerhouse singer with great stage presence, it seems only appropriate to capture Blue in her element, so she�s released LIVE Volume 1 on her own Big Blue Records. 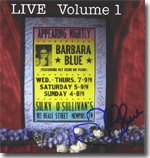 Slated as the first of three releases, LIVE Volume 1 was recorded in October and November of 2007, and presents Blue�s sparkling take on some classic tunes (�Hound Dog,� Sippie Wallace�s �Woman Be Wise,� Koko Taylor�s �Wang Dang Doodle,� �Stormy Monday,� and �Lose Your Good Thing�) along with some favorites from her previous releases (�The Road Comes To Me,� �Someday Someway,� �Can�t Get Your Loving Off Of My Mind,� �Toolbox Blues,� and �Rainy Night In Memphis�). Blue sounds fantastic. Her vocals range from big and brassy to smoky and seductive. Her interplay with the audience is confident and relaxed. Her working band is first-rate and includes her longtime piano man Nat Kerr, guitarist Corey Osborn, and Lannie McMillan on saxophone. Kerr, Nancy Apple, and Reba Russell contribute backing vocals. It all adds up to another great release from Barbara Blue, who has developed into one of the most talented female blues singers working these days. It will be interesting to see what the upcoming Volumes 2 and 3 have to offer. They�ll be hard-pressed to top LIVE Volume 1.